Moderator says: Jimmy how's it going with your new CD? Steve says: I'm just outside of Cleveland. JoeNovack says: Jimmy, Did you go to Beirut? JimmyB says: Okay Michael, where are you from? JimmyB says: WHere is Veracruz? JimmyB says: What is it near? Moderator says: very cool, is anybody in Europe? 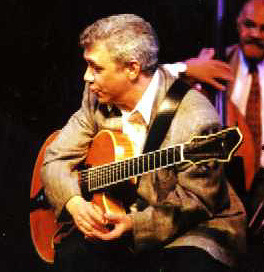 JimmyB says: Any jazz there, Michael? JimmyB says: Do they ever book anyne from the states? JoeNovack says: Jimmy, did you go to Lebanon? Ian says: Out of all your albums Jimmy, My personal favorite is "Like That" . You sure burn on Pat's house!! MichaelStrah says: Jimmy, what label are you on? Ian says: Yea I saw that in this months Jazz Times. I will buy it a soon as the music store gets it in. DavidH says: Jimmy, will you have the CD at the NY guitar show? Hank_Garland says: Billy says Hi! Ian says: Hank Garland is awesome. I heard he was getting back into playing.. ?? Hank_Garland says: The real one! Moderator says: Jimmy can you talk about these CDs? don_price says: Let's all listen to Eternal Triangle while waiting for Jimmy. I've got it on right now. Kind of sets the mood. WesleyDick says: For anybody interested I have a clip of Jimmy's Move at my web site. With his permission, of course. Moderator says: where was this concert? 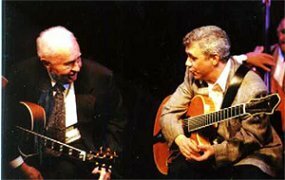 Steve says: I got one.. is that you with Herb Ellis??? DavidH says: Jimmy, are you playing the tribute to Johnny Smith at the JVC concert this year?? JimmyB says: We were also running out of time and the stage hands union was threatening to pull the plug! Ian says: Do you have any scheduled gigs in Canada coming up? DavidH says: Jimmy, are you playing the Benny exclusively now? 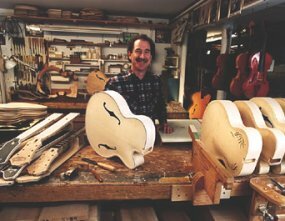 DavidH says: How about at the upcoming LI guitar show?? will we hear the Benny? don_price says: Fusion as in.....? 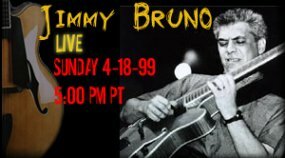 joesilver says: Jimmy Bruno rocks out...Is nothing sacred? 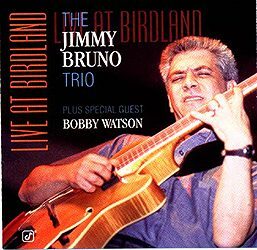 JimmyB says: NOw there's a jazz face!!!!!! don_price says: Very colorful pic! DavidH says: Is that now because you have the Benny or did you always bring two guitars? WesleyDick says: Does using 2 bennys allow one to cool off between tunes? Steve says: Solid... Fusion... What next??? DavidH says: Which is the 16, the one with the built-in pickup?? is your floating pickup a 17"
Hank_Garland says: How many frets? 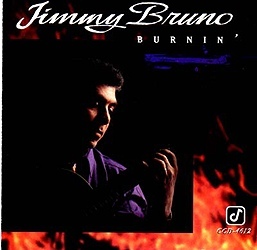 don_price says: Fusion ala Scott Henderson, Mike Stern, McLaughlin, or something new we need to term the "bruno fusion project?" Ian says: I noticed your string guage is really high (big strings) Is your action set relatively low? don_price says: What a beautiful axe! WesleyDick says: I notice no pick guard..
DavidH says: Why no pick guards? WesleyDick says: Look at all the broken guitars!! 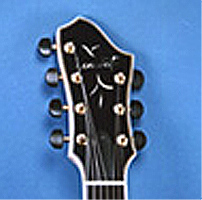 Steve says: Is that pickup mounted in the top or is it a floater? WesleyDick says: I'm sure he can fix 'em. WesleyDick says: Good as new! DavidH says: Jimmy, I hear you play with really high action?? Is there a reason? Steve says: Do you have a strong preference?? Ian says: Is your string action set low for those huge strings you play on? JimmyB says: Most people consoder the action high. DavidH says: I guess that you don't consider it high? DavidH says: Have you tried playing with lower action? don_price says: what amp do you have on screen? DavidH says: I see the Raezer's Edge cabinet... I played through Dale Unger's a few weeks back...What a sound! My 7-string sounded amazing! don_price says: speaker cab only -what do you use for the power side? JimmyB says: ickup which sound fine too! Steve says: I see your pick, Jimmy. How thick is it? JimmyB says: It's like a Fender extra heavy 1.5mm? DavidH says: Where do you get those picks? DavidH says: Are they readily available? don_price says: what about strings? don_price says: flats? Nickel or otherwise? 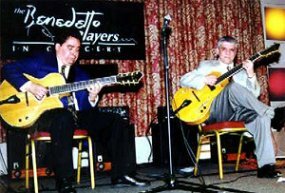 DavidH says: are you using the Thomastik 7-string?? 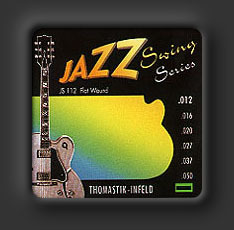 don_price says: Thomastik strings? Did I hear correct? 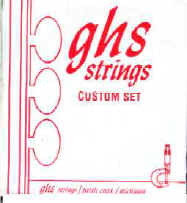 DavidH says: How oftern do you go through strings? don_price says: Do you have a preference between cromes, stainless steel, or nickel? joesilver says: BRB. I'm going to try the "all-purpose fix" for my browser problems: Re-boot! don_price says: high action and "round"? don_price says: flats or half-roundwound or straight wounds? DavidH says: which CD is MOVE on?? WesleyDick says: Live at Birdland. don_price says: rounds I think. I require flats on my axe. don_price says: Yes, Live at Birdland. Kicks! don_price says: Nickel flats for me. Each to his/her own though. pmfan57 says: You may have never learned a blues scale on purpose, but you must have just by listening to Charlie Parker records, right? Steve says: I do... I've already copped that lick. 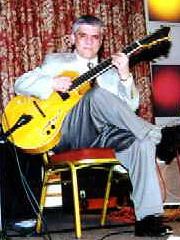 don_price says: you must "feel" and hear the blues to play it! pmfan57 says: what fundamental scale do you fool with to get the blues scale? don_price says: That's personal education right there. don_price says: We are being educated right now! Steve says: I hear a little Charlie Christian in that lick. don_price says: That last lick seems to be located in and around a 5,3,7,1 intervalic voicing in 10th position. 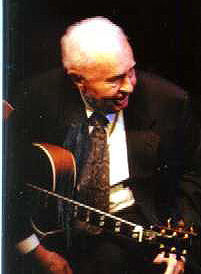 don_price says: Mixolydian, chromatic, minor pentatonic/blues lick. That's it! don_price says: arps are always there, right? don_price says: You think "key area" or "parental" scale forms. Correct? 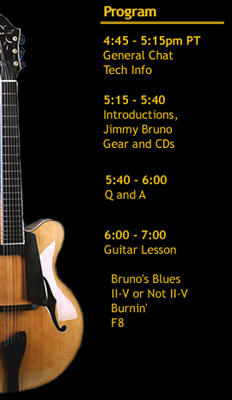 don_price says: Jimmy - what guitar did you record that riff on? Moderator says: Jimmy are you using sweep picking on the middle section? don_price says: Sounds more like extra fast triplet feel someplace midway in there. fernando says: Jimmy, are you going to have a book published on your music that you have written? I'm really interested in your song "Big Shoes". fernando says: could you tell us a bit about Big Shoes? Hank_Garland says: What is it called? GrantG says: hi don. so what have we all learned from JimmyB today? GrantG says: i try to tape every gig, and every practice. GrantG says: I will. Who else did you play w/? He was just played w/ Joey D again. Jimmy. 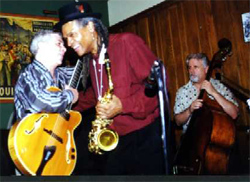 DO you have any plans to come to Blues Alley in DC anytime soon? JimmyB says: are there any final thoughts, questions comments etc. Moderator says: OK here's the file for "F8"
joesilver says: F8? That's the name of the tune? JimmyB says: f8 is the name... lower case "f"
fernando says: Jimmy, will you be selling the Mel Bay book, or should I get it at the store? joesilver says: What about previous chats, like the ones with Hank and the one with Frank Vignola? Will those be made available anywhere?